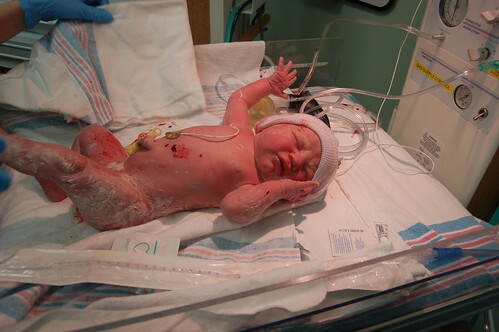 Born on Tuesday January 20th at 1:46 in the afternoon via c-section…. 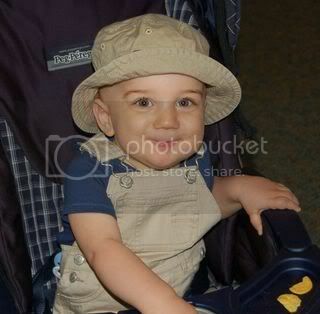 Today is your last day as an only child which means that tomorrow is your first day as a big brother. Life as we have been living it for the past three things is suddenly going to change for you and I’m sad for you about that but at the same time I feel excited for you….elated almost. You have been the most important person in my life for the past two and a half years and I want you to know that when your sister comes tomorrow, your importance in my life does not change or alter in any way. 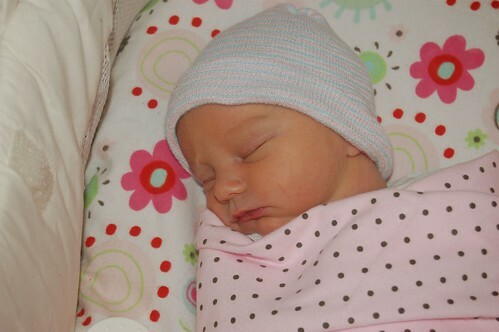 You are the sunshine and breath in my life and I will always have a special place in my heart for you right along side the special place that is growing for your new sister. You are the one, the child that gave me the gift that no other child will ever give….your birth brought me the most compassionate, thrilling, life altering experience of my life – the gift of motherhood. Before you entered my world I never expected that I could be so changed, so moved and so altered, yet here I am nearly three years later a mother to a child that turns my half empty cup to one that is half full. 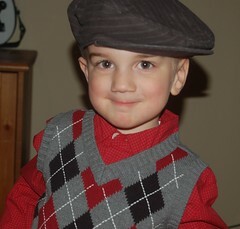 As the days have passed I have watched you go from helpless newborn, dependent infant, curious toddler and now a challenging and adventurous preschooler….I would not have missed a single moment. From the moment you were born I have been fascinated with everything about you and have spent every day since the second of your birth trying to know you, to understand you, and to love you in the way that only you need to be loved. Everything about you is enchanting and invigorating and even during the times that you are away from me I find myself wondering what you are doing, what you’re thinking, and what new adventure you might be up too. I am obsessed with loving you and with wanting you to feel loved. I know that the next few weeks might be difficult for you as we adjust to having another person in our family…it will be hard for Mommy too but the biggest and perhaps most important thing that I want you to understand is that I love you and no matter what I am always going to love you. 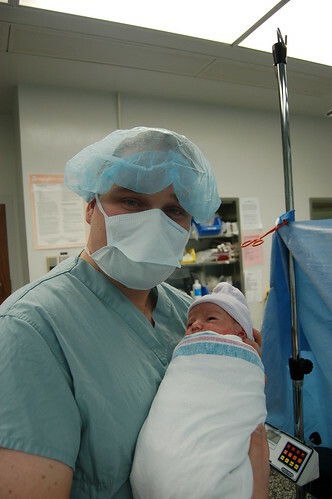 I understand if you are mad, or confused about your new baby sister but I promise you that after a little while it will be hard to remember what life was like before she joined our family. If there is one thing that I have learned from being your Mama is that I should never assume that you will react a certain way because time and time over the past few years you have shown us that change is not so hard for you – you have always been the go with the flow type of boy but I guess I’m letting you know that it’s ok if this change is too hard for you – it’s ok if you don’t understand as long as you know that every body who loves you is still here to take care of you and love you just the same. I am so proud of you Jacob and I feel privileged to be your Mommy and I can’t wait to see you as a big brother to your new sister. I look forward to playing with you both and watching you teach her all the things that you know about the world. You are so smart, curious, hilarious, and perfect just the way you are….don’t change….ever. I admit that our energy has dwindled over the last little while so we are still slowly working on getting the nursery completed. 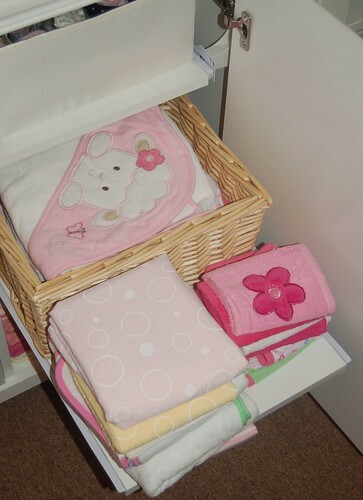 I’ve purchased some wicker baskets and canvas bins for her room and am now on the hunt to find just ONE more sage canvas bin because it turns out they are being discontinued by babies R us! You might recall me writing about the arm chair that we wanted for the bedroom that was also discontinued at babies R us…well I guess it popped up online one day and my mom ordered it for us! Imagine my surprise when the post man rang our door bell with this huge package…..it looks perfect in the bedroom! I’ve spent the last little while getting her clothes folded and into drawers as well as working on making sure the room was stocked with diapers, wipes, baby products, etc. I think the room is turning out to be quite quaint and I can’t wait until we start hanging some things on the walls! I’m especially excited about picking a name and getting wall letters to hang over her crib…I think it will be the perfect finishing touch! 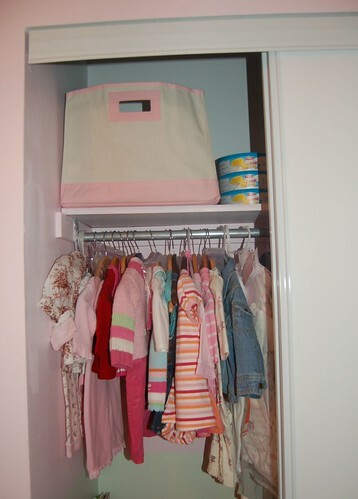 This is the left side of her closet….in the pink and white canvas bin are various things for later such as sippy cups and hand print kits. 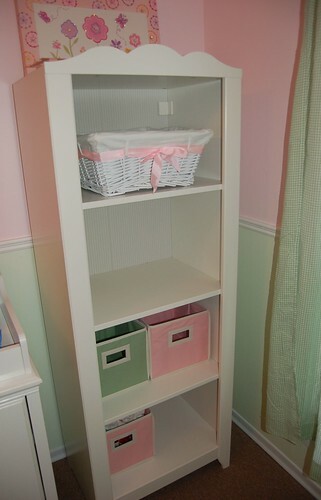 The right side of her closet….in the sage and white canvas bin are extra blankets. 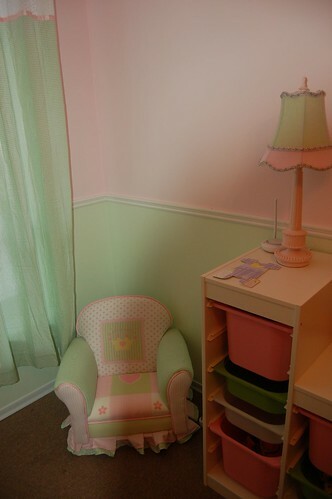 The new pink and green arm chair in the corner! 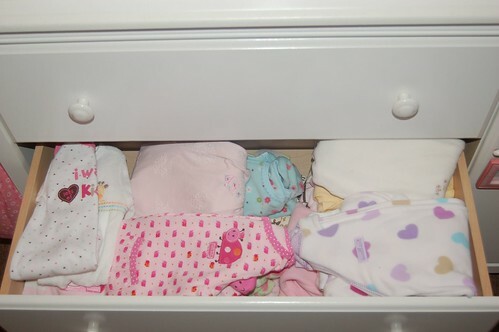 The bottom drawer of her dresser filled with Newborn, 0-3 and 3-6 month clothing choices on the left and bins filled with hats and swaddle blankets on the right. 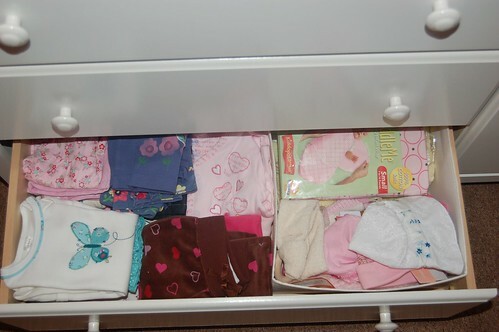 Middle drawer filled with sleepers, gowns, and sleep sacks in size newborn and 0-3 months. 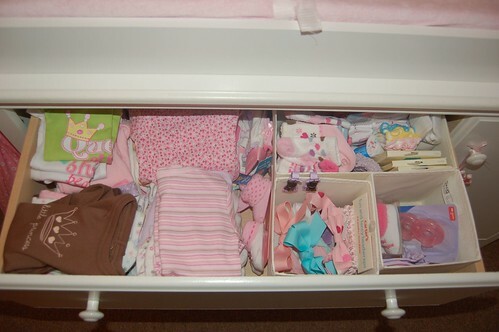 Top drawer with newborn and 0-3 month onesies….bins filled with socks, booties, hair pretties and pacifiers. Book shelf with new wicker basket (pink ribbon) on top shelf and canvas bins on the bottom shelves….still trying to find one more sage bin. 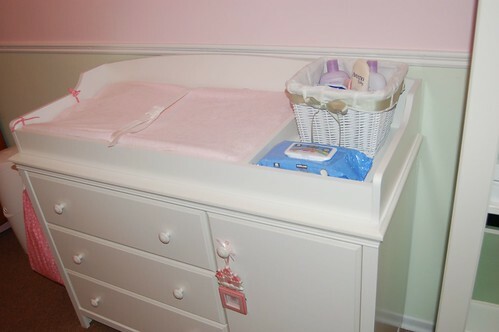 Change table with new covered change pad, wicker basket (sage ribbon) filled with baby products…small hanging picture frame on door. 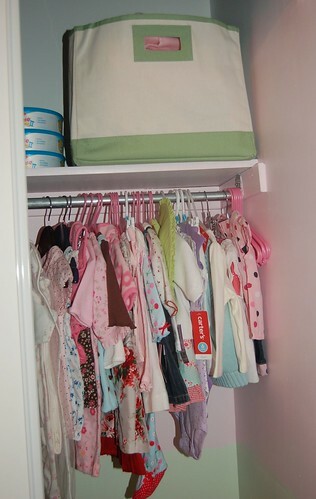 The inside of the closet – First shelf has bins with bibs and shoes. 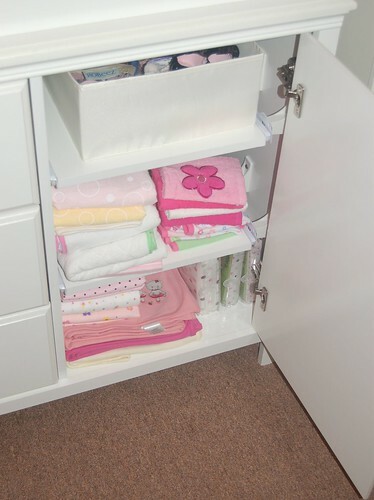 Second shelf has change pads, wash cloths and hooded bath towels! Bottom shelf is stocked with receiving blankets, extra crib sheets, mattress pads, and covers for the change pad on top of the dresser! I had such a nice day today! It started with Mike and I sleeping in which for me meant that I got up at 845 am instead of my usual 7-730 am wake-up time. I quietly came down stairs so that Mike could sleep for another little while (he got up at 10am) and then the two of us made a nice breakfast together! We sat together and enjoyed a nice home made breakfast of eggs, sausages, hashbrowns and toast! It was really great to just work together to make a nice scrumptious meal and enjoy each other’s company. When we were done eating we spent some time getting all the laundry done since we were very badly behind and it feels good to know that it’s all done and we dont’ have to worry about it over the next two days. Around 130pm my mom came and picked me up and the two of us were off to the spa for pedicures, manicures and eyebrow waxing! If you listened closely I’m sure you could have heard the sigh of relaxation that escaped from my lips – the pedicure and manicure felt wonderful! Mom and I chatted while we were both pampered and relaxing in the great big leather massage chairs! When it was all done I went home and enjoyed a nice lunch with Mike and then spent time folding the laundry we had washed and dried earlier! 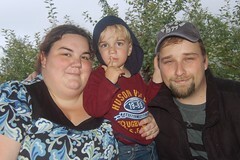 At about 4pm Jacob came home from his grand parents house and we spent some time together as a family! After dinner, a bath for Jacob, story time, and bedtime…Mike and I curled up on the couch to watch yet another episode of the new series we’ve been into and enjoyed each other’s company yet again. Oh yes, it was a good day indeed……now tomorrow we can be back in OH MY GOSH WE’RE ABOUT TO HAVE A BABY mode. Pray for us. Jacob is having a “sleep over party” at his grand parents house tonight and Mike and I are enjoying some alone time together. We started the night by enjoying dinner at a nice italian restaurant after which we returned home, threw some laundry in then snuggled up on the couch with bowls of peanut butter cup ice cream to enjoy a new TV series we’ve been indulging in called True Blood (on HBO). Tomorrow morning we’re hoping to sleep in and then enjoy a nice breakfast together – maybe we’ll make some hashbrown’s, sausages and eggs if we feel up to it. In the afternoon/evening we’ll arrange to pick up Jacob (after my pedicure with my mom) and we’ll spend the rest of Saturday and all of Sunday together doing some family activities….I’m thinking Mike and I will make pancakes for breakfast on Sunday morning and then maybe we’ll think of a nice community activity we can do as a family. The interesting thing about this all is that the next couple days will unfold just how our family life has evolved from just Mike and I (two) then Mike, Jacob and I (three) and then finally on Tuesday morning we start our lives as Mike, Jacob, Baby and I (three). It’s amazing how hard we’ve worked to try and get things in order before the baby comes and this pregnancy compared to Jacob’s we’ve had a lot of extra time to arrange and rearrange everything around our house. The bags are packed and the baby’s room is well stocked but yet I have this strong feeling of not being ready. I have been pregnant an extra two weeks in comparison to Jacob’s pregnancy and while I’m anxious to meet my daughter I still have this feeling that I could go on for another week or two and be perfectly content. I think it has a lot to do with how good it makes me feel that this time everything is “proceeding as it should be” and it probably has a lot to do with the part of me that revolts the idea of the c-section. 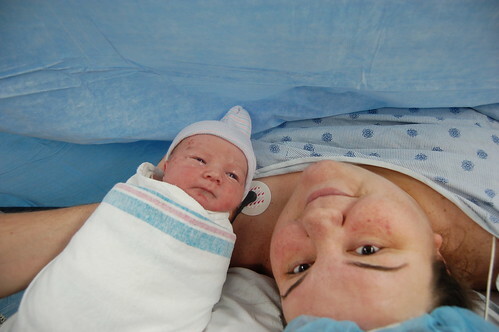 The most ideal situation for me at this point would be to go into labor this weekend because I truthfully believe that my body can do it on it’s own….I feel different this time and I’m upset that maybe I didn’t fight hard enough to avoid the c-section. I am scared and anxious about surgery in a way that I haven’t felt frightened in a really long time. I am trying hard to keep my chin up this weekend and not focus on the worry so that I can enjoy some time with my family. At the same time I am trying to get a few more things done around the house this weekend perhaps in an attempt to feel “more ready” or perhaps because it helps me to feel less worry….either way we’ve started doing laundry tonight and tomorrow Mike is going to paint the door on the baby’s room. 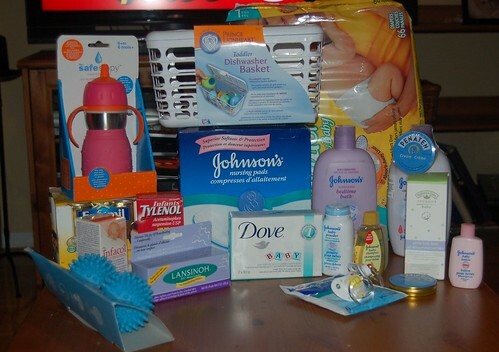 I think what it all boils down to for me at this point is that no matter how hard you try to prepare, plan, and organize for a baby coming home….nothing truly can give you that 100% ready feeling so I guess I have to just stop waiting for that feeling to come and get prepared to just jump in when she gets here. I’ll start off by saying that the baby is good and growing well and I am physically doing well after my appointments today but I’ve just had a very emotional day today overall and for now I’d prefer not to get into the explanation of it all….the short story is my OB at my appointment today just made me feel like he is really incompetent and I am 6 days away from needing to trust him with a major surgical procedure…Perhaps tomorrow I will get into the details a bit more but for now I’ll just leave it at that. I’ve been sitting here feeling down with a throbbing headache – the direct result of crying and being overwhelmed today so I thought I’d share something I purchased yesterday that really just made me feel good. In my pregnancy with Jacob I really struggled to find a carrier that would work for me primarily because of my large chest and weight so I found a lady on etsy who agreed to make me a custom one for just 5.00 extra! I know it’s going to work because it’s going to be custom done just for me which makes me so excited! In addition she’s doing a nursing cover for me in the matching fabric! When the baby is a bit older I plan to get an ERGO carrier but this is a good start for me I think and it was only $45.00! What a deal for a custom made carrier! 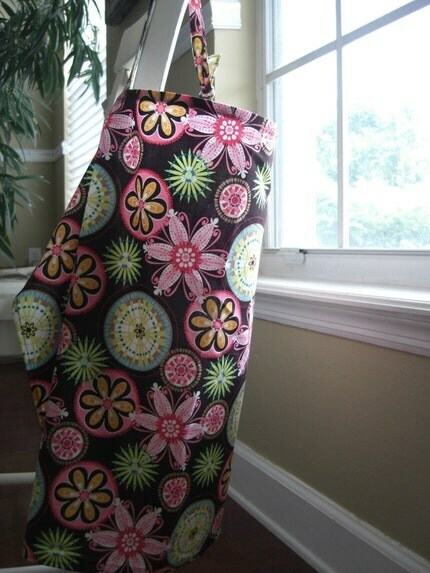 Here is what the nursing canopy will look like! The countdown is on and we’re in the final stretch until we meet our baby! I can’t believe that in just 8 days this whole pregnancy experience will be over. I have to say that despite the morning sickness and exhaustion it’s been a wonderful pregnancy this time around and I’d never have believed in the beginning that I’d still be pregnant at 37 weeks. 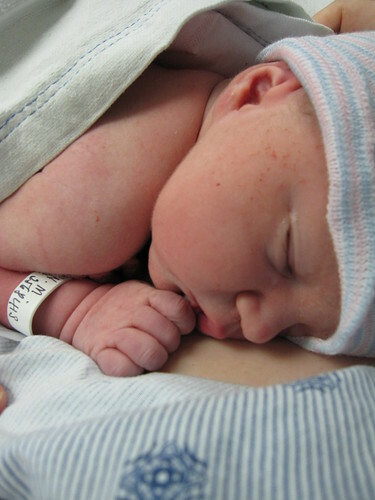 We are delivering this baby at 38 weeks 1 day and while everything in my heart wishes the baby could just come on her own, i have faced the idea of the c-section and feel ready to go. My anxiety levels are at their peak right but I’m certain that the peak will only raise higher until the moment that I’m sitting in recovery holding my baby girl. Despite the fact that my pregnant days are dwindling, I’m actually feeling pretty decent! Of course I’d love to have less hip discomfort and I’d pay for a good nights sleep but overall I can’t complain too much as I’m certain that it could be far worse then what I’m experiencing. Yesterday Mike and I went out and purchased the remaining items we needed for the baby’s room and while it was quite pricey we now believe we have everything we need for when the baby comes home (aside from one sage canvas bin because they were sold out). Yesterday we picked up the change pad for the dresser combo, a baby monitor, Dr. Brown’s bottles, breast milk storage bags, diaper rash cream, 2 pink square canvas bins, 1 sage square canvas bin (need one more), 1 sage and cream Canvas tote for the closet, and a breast pump. We are really hoping that I will have a great milk supply this time and that we’ll get to return the breast pump so we’ve put it aside with the receipt and we won’t open it unless we have to. The house has gotten a bit disorganized in the past couple of days because we’ve been so busy with the shower that was thrown for me and doing all of our errands yesterday (babies r us, groceries, costco) but despite this Mike was able to put together our new stroller, set up our old pack and play and put together the swing we got from my mom’s storage. 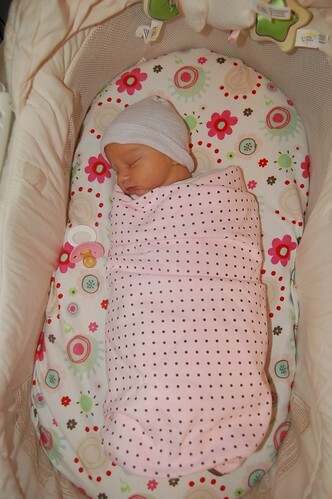 We also spent some time together putting together our play mat for tummy time and getting our car seat ready to go….complete with our new pink bundle me bag! 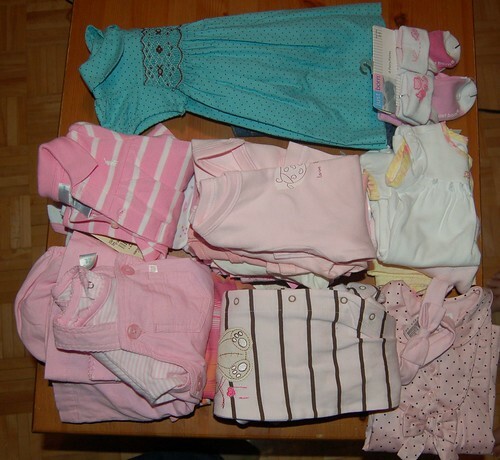 I started packing the baby’s bag which I just need to add a few more things and its ready to go! I am hoping that at some point today I can find the energy to do some laundry and organize some stuff but I seriously doubt I will because quite frankly I’m feeling pretty tired today and I think I’m coming down with a cold just in time for delivery! Ha! I love the universe and how it works! I’m currently working on a big brother present for Jacob from the baby so I’m hoping to get to Walmart this week at some point to get him a new story book and some new pajamas for when he sleeps over at Nana’s house the day of delivery! We already picked up a small wonder pets suitcase on wheels for 14.99 just prior to Christmas and a wonder pets DVD so we’ll just add the story book and jammies with a few of his favourite snacks and I think that is a wonderful gift that he’ll enjoy! I’ve been so sad for him the past couple of days because I am realizing how unprepared he is for this baby to come home despite that fact that we’ve been trying to prepare him for so long now (but more on that in a future blog post). 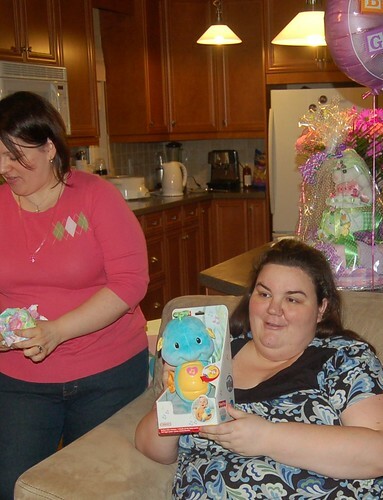 I just hope that he does ok next week during this whole transition….we’ve tried to make the transition smooth by having Mike’s mom watch him at our place during the delivery because that’s totally what the norm is for him….time will tell I suppose. I can’t believe its almost over! 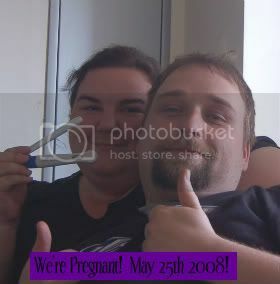 It seems like so long ago now that we were anxiously watching the pregnancy test to see if we had “sealed the deal” so to speak! Remember this picture? Wow! May 25th 2008! 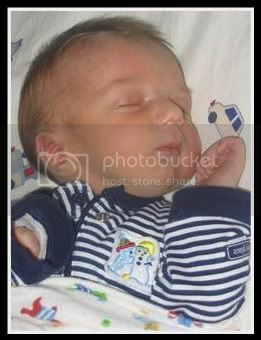 It’s now January 2009 and it feels like so much time has passed so quickly! I have my biophysical profile tomorrow and then what will probably be my last appointment with my OB before delivery. Crazy! 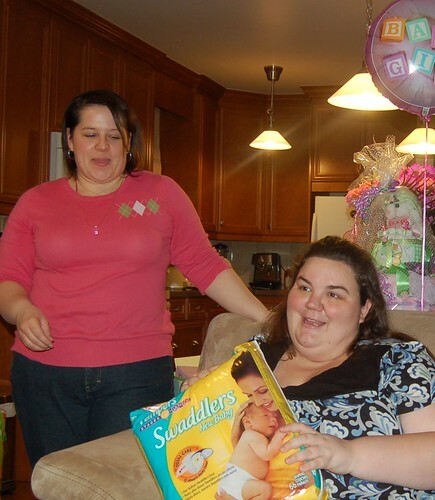 My mom and best friend Lisa threw me a little baby sprinkle yesterday and it was a great time! 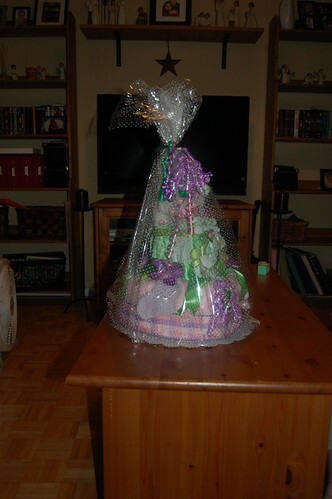 I think we still managed to get spoiled by family and friends even though it was much smaller then Jacob’s shower! 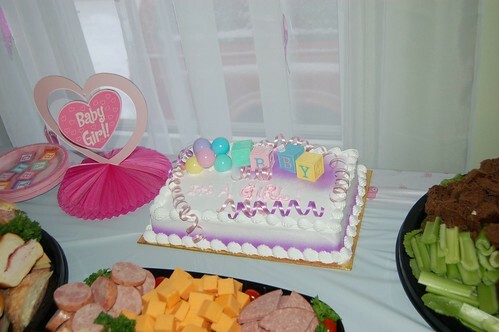 I never assumed anybody would throw us a shower since it was our second child so it was a very pleasant afternoon! I am so grateful for everyone that came and all the hard work that my mom and Lisa put into planning it! 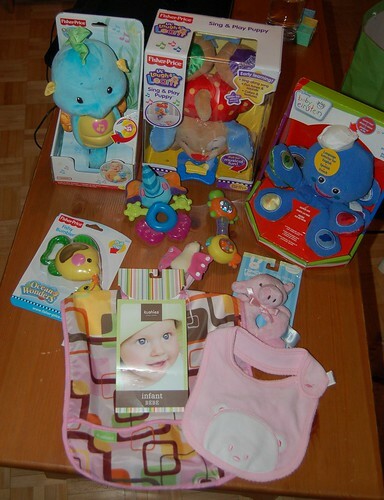 Here’s some pics from the day and a few pics of the generous gifts we received! I want this chair so badly for baby girl’s bedroom but alas it is no longer carried in-store at toys r us! What a bummer because it would fit perfectly in the corner by the window but sadly I am left to just remember it as a distant memory! Ha!